"Your Chiropractor uses the latest chiropractic technology in caring for you using the Impulse IQ Adjusting Instrument. This is patented and FDA registered device was developed to provide gentle and precise computer aided chiropractic adjustments to relieve pain and aided chiropractic adjustments to relieve pain and restore function. 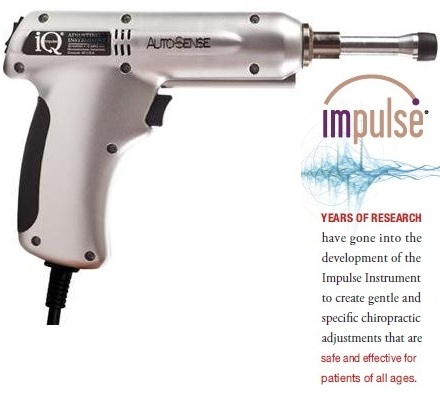 The state of the art Impulse IQ is controlled by micro-computer circuitry housed within the device that produces a controlled force that chiropractors can use to treat different areas of the body. Computer-assisted chiropractic adjusting with Impulse IQ gives the doctor objective feedback about how your problem area is responding in real time for custom tailored treatment just for you."